Dave Ulliott has taken the poker world by storm. A world-class competitor, he's one of the most feared players on the burgeoning global poker circuit. Tagged "The Devil Fish," Ulliott was a petty criminal at 16—a safe-cracker who spent his 21st birthday in prison. After becoming a pawnbroker, he turned his gambling hobby into a hugely lucrative career. Ulliott was the first British player to win a $500,000 poker tournament in the U.S., the first player to win the Late Night Poker series on Britain's Channel 4, and is now the face of Ultimatebet.com, one of poker's biggest online sites. This record is an insider's account of the amazing world of professional poker, revealing, for the first time, the extraordinary stories of the world's top players. 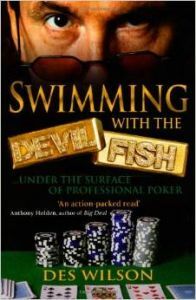 A must-read for anyone interested in the astonishing growth of professional poker, from yesterday's illegal back-street games to the television and cyberspace phenomenon of today.